Aperture is pleased to offer a very special limited-edition print and book boxset, featuring three unique components created as part of Meyerowitz's most recent project-a compelling body of work resulting from a commission he received from the New York City Department of Parks & Recreation to document the city's parks. 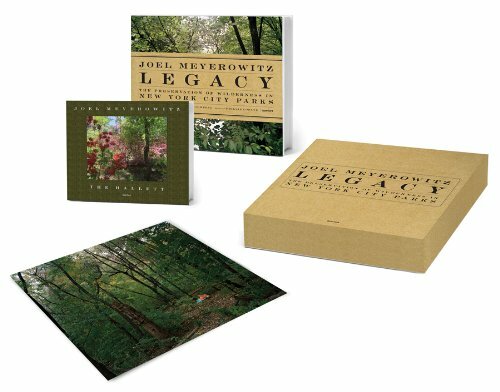 Each custom-designed clamshell box contains a copy of Legacy: The Preservation of Wilderness in New York City Parks with a special-edition bellyband, as well as The Hallett, a limited-edition book featuring one of the artist's favorite spots-the Hallett Nature Sanctuary in Manhattan. The Hallett was designed and printed exclusively for this edition using an HP Indigo Digital Press. Also included is a 10 x 12 inch HP archival pigment print, made personally by the artist. Each book and print is signed and numbered by Meyerowitz.